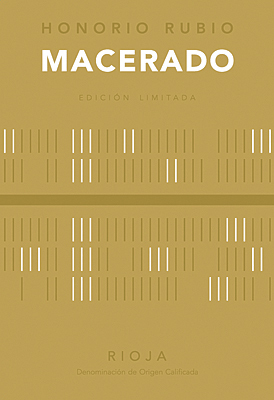 Honorio Rubio’s long skin contact aged “Macerado” is one of his five limited production series wines. It combines the long skin contact “orange” wine style of the thousands of years old traditions of Georgia wine with a selection of his best high altitude Viura grapes. While clearly “orange” in hue. It is not as severe in style as some long skin contact wines, and maintains some of the character of a classic table wine. It began with Honorio’s efforts to explore traditional methods of stabilizing wine and the idea of creating world class whites with his best grapes. For “Macerado” Honorio took cues from “orange” wine producers from Georgia, Macedonia, Yugoslavia and Greece, and the natural wine movement’s valorization of lost techniques. The result is a seamlessly balanced wine offering the yeasty intensity and distinctive flavors of an “orange” wine, that at the same time retains its Rioja identity. The Honorio Rubio “Macerado” White 2013, is a bright, orange tinged, straw color. The nose is deeply fragrant with bright notes of apricot, fresh mission fig and lemon with notes of bee pollen and yeast. The attack is exceptionally bright with a core of apricot, pear and lemon flavors and musky notes of lemon zest, tea and persimmon. The mid-palate is well-balanced and lively with additional notes of baked apple. The finish is very long and lingering. A striking and extremely refined “orange” styled Rioja wine. 1500 numbered bottles made. Elaborated in the ancient method of long grape skin contact, often referred to as “orange wine.” It was kept in contact with skins until bottling on September 30, 2014.